Grand Marais MI sits on the southeast coast of Lake Superior. This little harbor offers excellent refuge in bad weather and is a gateway to some incredibly beautiful shoreline - specifically the breathtaking Pictured Rocks National Lakeshore. This national park extends for some 50 mi/80 km. In one 15 mi/24 km stretch, sandstone cliffs of ocher, tan, white, green, orange and black layers tower up to 200 ft/61 m above Lake Superior. For 10 days this past month, the chilly winds and gloomy skies were pushed aside as the Toronto Boat Show brought its promise of boats, kit, good weather and fun to thousands of visitors. I was fortunate to once again speak at the show and over the course of 7 seminars, I got to meet many people who either sail or want to sail extensively on the Great Lakes. It was a lot of fun to meet friends, people whom I have seen in past years, readers of Great Lakes Sailing and new people beginning to explore this idea of going further afield to see what our "Sweetwater Seas' have to offer. Thanks to all who dropped by to participate or just too say 'hello'. David Sandford is a professional photographer based in London ON. 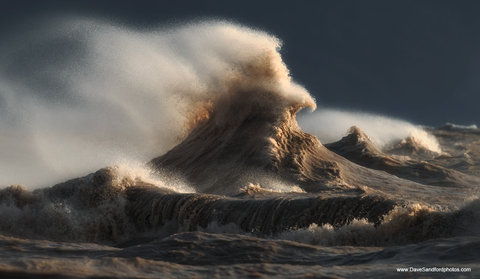 Among his extensive portfolio are stunning pictures of Lake Erie taken long after many of us have put our boats on the hard for the winter. Below is an example of one of his photographs. If you would like to see his incredible photographs, check them out on his website here. Usually at this time of the year, we could expect the ice cover on the Great Lakes to be at about 60%. However, this year it is a mere fraction of that - about 8%. Notwithstanding several recent winters of extensive ice cover, bone-cracking cold temperatures and significant snowfall, the long-term trend has been for warmer temperatures and reduced snowfall. This has implications for us as boaters. Extensive ice cover significantly slows evaporation and heavy snowfalls add to the volume of water in the lakes and in the streams and rivers of the entire Great Lakes basin. Nearly 13 million (yes, that's million) gallons of raw, untreated sewage were discharged into Lake St Clair the day after Christmas as a result of a sinkhole that destroyed parts of the sewage system in Fraser MI, near the shoreline of Lake St Clair. The cost to repair the shattered system is estimated at US$150 million. It is not likely to be completed any time soon. Where did it all go? Well, it went downstream into the Detroit River and Lake Erie where cities like Detroit, Windsor, Toledo and Cleveland all draw their drinking water. Here is an interesting (alarming?) and little known fact. Authorities are very concerned about Super Bowl Sunday because ...... more people flush their toilets at half time than at any other time in the entire year! The fight continues to stop Ontario Power Generation (OPG) from permanently disposing of millions of liters of nuclear waste in a disposal site at Kincardine ON, on the shore of Lake Huron. The OPG report acknowledged that there are other suitable sites outside the Great Lakes basin - a basin that supplies the drinking water to 40 million Americans and Canadians. OPG baldly stated in its report that the general public did not particularly care about this nuclear waste dump. That statement is completely false. Elected officials and communities representing 23 million Canadians and Americans have passed resolutions opposing this. The Government of Canada will make a decision in the fall. In the meantime, if you care about the incredible and irreversible safety hazards this represents to our magnificent Great Lakes, let you elected MP, MPP, Congressman and Senator know that this is an unacceptable action. They have been called the "Dinosaurs of the Deep. Lake sturgeon can be traced back nearly 200 million years. Once plentiful in the Great Lakes, in a period of less than 200 years, they were fished to the brink of extinction. Declared a protected species now in Ontario and 19 states, this largest of all species in the Great Lakes is slowly making a comeback. These are large fish. They can grow to 8 ft/2.4 m and weigh in at 250 lb/113 kg. They are long-lived with males living to 55 years and some females reaching the ripe old age of 150 years. However, they only mate once or twice each decade so population growth is slow. There are a number of research projects being carried out cooperatively between American and Canadian researchers who are monitoring and studying the comeback of this 'ancient mariner' of our Great Lakes. One of the things that I have always enjoyed about sailing is how so much of what we say and do today is bound up in the customs and traditions of long ago. Adrift was a word used by sailors to describe anything which had come loose or gone astray. In time, it came to mean someone who was late or lost. Ultimately from this word came drifter - a person who had no goal or aim in life. Derrick While not as familiar as M. Guillotine's murderous invention, this name for a device to hoist cargo on board a ship takes its name from an individual as well. When these booms first came into use, it was remarked that they resembled the spar and topping lift that one Mr. Derrick, the hangman at Tynham prison used to hoist condemned men to the gallows. The name stuck.